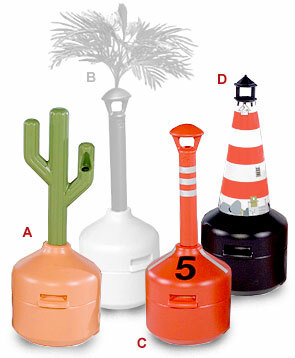 The unique designs of these attractive cigarette receptacles are great for use at any office, factory, restaurant, hotel and/or resort aspiring to promote cigarette litter free areas. Fabricated from up to 15% recycled plastic polyethylene, receptacles will not rust and/or corrode. Their special design minimizes smoke exit and water entry. The large 4 gallon steel pail holds over 3,000 cigarette butts and is easily removed for cleaning. Optional odor-absorbing / fire suppressing filters and a security anchor kit are available. Optional concrete anchoring kit includes a drill bit, two anchoring screws and two flat washers.